Stephen Merchant’s Project, ‘Hello Ladies’ Gets an Eight Episode Order At HBO!!! We previously reported that HBO greenlit a pilot episode for Merchant’s ‘Hello Ladies’ series, but now, HBO must be very happy with the project, because it just got picked up for a 1st season consisting of 8 episodes. The pilot was co-written, directed, and stars Stephen Merchant. The series centers on Merchant as a gawky Englishman searching for the woman of his dreams in Los Angeles. Half as charming as he thinks he is — and twice as desperate — he’s obsessed with infiltrating the glamorous world of beautiful people. Unfortunately the beautiful people won’t let him in according to Deadline. Merchant went on a stand up tour last year and explored this situation, and it was received very well. The pilot stars Merchant, Christine Woods, Nate Torrence, and Kevin Weisman. No word yet on if Merchant’s pal and collaborator Ricky Gervais will be involved. This is great news. I love Merchant’s work, and this sounds very funny. Can’t wait to see it. Your thoughts? Check Out The Trailer for Stephen Merchant’s New HBO series ‘Hello Ladies’!! 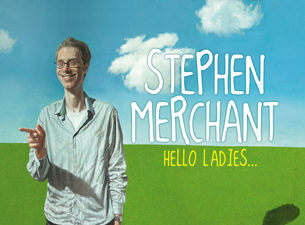 HBO and Stephen Merchant Team Up For ‘Hello Ladies’!!! HBO Teams Up With ‘King of the Hill’ Duo Mike Judge and Scott Rudin For Comedy Series!!! Find Out What’s In Store For ‘The Ricky Gervais Show’ In May!!! This entry was posted on Thursday, November 1st, 2012 at 3:28 pm	and is filed under News, Television. You can follow any responses to this entry through the RSS 2.0 feed. You can skip to the end and leave a response. Pinging is currently not allowed. « Jamie Foxx Might Play the Villain in the Next Spider-Man Movie!!! [to Separatists] I am sending you my apprentice, Darth Vader. He will... take care of you.